The holidays are coming. All those scrumptious meals and tasty desserts have the tendency to pack on a few extra pounds. What to do? What to do? No problem, Mill Creek Entertainment has already anticipated the need to get back into shape … and to take some of the stress out of the busy shopping season as well. On Nov. 4 three new additions to its popular fitness “Best Self Fitness” series of DVD products will be available … and at the fit-to-own price of just $9.98 each. First up in the mix is kettlebell expert, author and former body-building competitor Sarah Lurie (who was also a Wall Street stock broker) with her Kettlebells: The Iron Core Way. This two-part workout routine has a threefold effect … it burns fat, builds lean muscle and develops core strength! Next is Zosha Piotrowski and her Stress Relief DVD release. This is a “Collection of Anaerobic Exercises for Total Body Health,” which is a fancy way of saying that Piotrowski delivers a series of intense routines (Pilates-based) that builds both endurance and replaces fat with muscle. And rounding out the Nov. 4 trio of fitness DVDs from Mill Creek Entertainment is one from college professor and Fitness Director at the Montreal Athletic Association, Shelly McDonald. Her DVD release is titled Bikini Body and it contains two separate workouts that are designed to burn, burn, burn all of those nasty calories! Take note, also on the DVD release schedule under the “Best Self Fitness” promotion banner are the previously announced titles that are set for delivery on Oct. 21. These are: Cardio Blast and Lindsay Brin’s Shed 5 Fast … both are also priced at just $9.98 each. Despite generating ticket sales of $49.1 million during its late summer multiplex theatrical run, director R.J. Cutler’s successful film adaptation of Gayle Forman’s 2009 best-seller, If I Stay, it would appear that MGM Home Entertainment will not be putting forth much of an effort in terms of the marketing, advertising or publicity for its home entertainment launch. Nov. 18 is when If I Stay makes the transition to the DVD and Blu-ray market place and the culprit behind this little-effort strategy is 20th Century-Fox Home Entertainment, which currently handles the sales and distribution of MGM-owned and produced film and television products. It is a bit sad (and with a certain level of irony) that the once venerable Metro-Goldwyn-Mayer studio has fallen in line with Fox’s recently adopted policy of not supporting current theatrical hits that are in the process of making the move to home entertainment arena. The reasoning behind this counter-intuitive move remains a mystery. This lack of sales support does raise one interesting question: Whatever happened to spirit of Ars Gratia Artis that so marked the glory days of MGM, or for that matter, United Artists? It has come to this … a former competitor is now dictating MGM’s marketing, advertising and publicity decisions! Shame! The ARR is a swift-to-market 88 days. Exclusive to the Blu-ray SKU is a three-part interview session featuring novelist/producer Gayle Forman and members of the cast and crew. Stallone and friends return for more explosive action on Nov. 25. 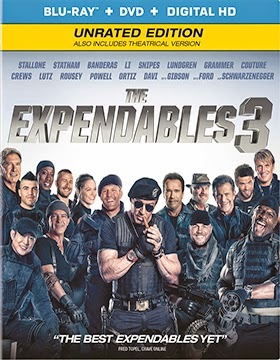 That’s the DVD and Blu-ray/DVD Combo Pack (bonus editions include UltraViolet) street date that Lionsgate Home Entertainment has selected for director Patrick Hughes’ all-star, all-action The Expendables 3. The ARR is 102 days and box office take came in at $39.2 million. A legion of actions stars of the silver screen (sans Steven Seagal, which seems deliberate and not an oversight) are back for another comic book adventure (which is deliberate) and both Wesley Snipes and Mel Gibson (as good guy and villain respectively) get in on the action this time around. Stallone makes no pretense with this series … it is tongue-in-cheek and is basically just a bunch of good ole’ boys getting together to blow things up. And that’s exactly what you get (in spades)! So have fun! Bonus features include an extended, unrated cut of the film (exclusive to the Blu-ray SKU), a gag reel, extended and deleted scenes, a pair of production featurettes — “New Blood: Stacked and Jacked” and “The Total Action Package” — plus an The Expendables 3 documentary. 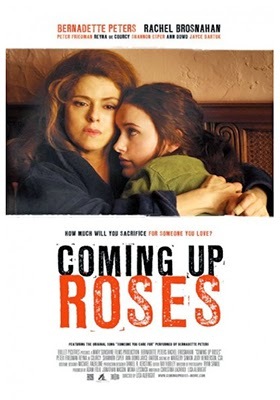 Writer/director Lisa Albright’s Coming Up Roses will be taking a DVD bow on Nov. 4 courtesy of Indican Pictures. Be sure to have a box of Kleenex handy for this little gem teaming Bernadette Peters with Rachel Brosnahan (House of Cards, The Unborn, The Blacklist) as mother and daughter chasing a dream … a dream that isn’t quite grounded in reality. Diane (Peters) is a fading stage performer who is no longer getting the roles, she still has the body and the charm of an actress acting, but she’s past her prime. She soldiers on … perhaps tomorrow the next big break will come. In the meantime her and her teenage daughter, Alice, are living from one meal to the next and not living in what one would called the best of neighborhoods … and it’s not anywhere near Broadway either. The whole dingy affair is set in the 1980s, so whatever happens to her and her daughter is already history. One day Charles (Peter Friedman) comes calling, not as a fan, but to collect the past due rent. Now the only thing that stands between Diane, Alice and the street is Diane’s charm … but is it all worth it? Desperation can unleash some really nasty demons and temptations and with Coming Up Roses filmmaker Lisa Albright packs plenty in the final stanza! Don't be surprises if you find yourself talking to the screen with advice on doing that ... on not doing this!!! There is the saying: “You are what you eat.” If that is the case, then Carlos (Antonio de la Torre — Unit 7, I’m So Excited, etc.) is just chock full of love … he consumes the women he desires, literally. Award-winning Spanish filmmaker Manuel Martín Cuenca’s film adaptation of the late Humberto Arenal’s award-winning novel, Cannibal, will be making its way to the domestic DVD market place on Oct. 21 courtesy of The Film Movement. It is a film that takes epicurean delights to whole new levels. Carlos is evil, there’s no getting around that. He sees a woman, desires that woman, he then kills and eats her. He’s more than just a little confused as to what true love is. Living in Granada, Spain, Carlos has repeatedly carried out his ritual of “seduction” and murder … and no one seems to notice. Accidents happen; people disappear. That is until Nina (Olimpia Melinte — My Baby, Seven Acts of Mercy, Killing Time) arrives in town looking for her twin sister Alexandra, who — you may have already guessed — went under the knife (he has a cabin in the woods that gives him the seclusion necessary to carefully prepared his “meals”). The irony being that Carlos wasn’t all that interested in her, but “hunger pangs” are what they are with a serial killer. There are twists and turns and it is not beyond writer/director Manuel Martín Cuenca to dangle some visuals here and there that get us to thinking. Visual and plot metaphors for bigger societal ills are teased that are far more “consuming” than Carlos’ dietary issues … this is a film that challenges the viewer to not be quite so quick in judging the protagonist. Still, with that said, Cannibal is a horror tale (more stylish than graphic) that can be savored on that level alone. Presented in Spanish with English subtitles, the DVD release of Cannibal arrives with writer/director Jean-Charles Paugam’s short film, Orge, as a bonus goodie. Breaking Glass Pictures announced this past week that Mexican writer/director Sergio Tovar Velarde’s 4 Moons (aka: Cuatro Lunas) will be making its domestic DVD debut on Dec. 2. Four separate stories involving relationships — relationships that are tested — make up Velarde’s 4 Moons, a film festival favorite that will find a wider audience on DVD. From young awakenings that are confusing and taboo to suppressed desires (a temptation in plain sight that cannot be resisted) to renewed friendships and that old standby of jealousy are explored. Presented in Spanish with English subtitles, bonus nuggets include deleted scenes, a blooper reel, newly-prepared interviews with the director and selected cast members, music videos and a bonus short film. 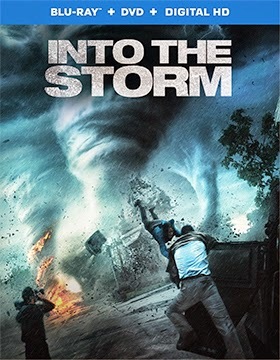 If you thought that director Jan de Bont’s 1996 film, Twister, was a one hell of a wild ride, then wait until you get a load of filmmaker Steven Quale’s Into the Storm. Warner Bros. Home Entertainment has tabbed Nov. 18 as the street for DVD and Blu-ray/DVD Combo Pack editions of this summer action film treat. The ARR works out to 102 days and domestic ticket sales were a very nice $46.7 million. 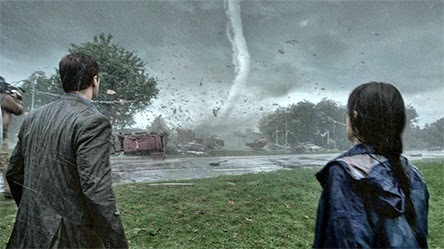 Into the Storm is Twister on steroids — thanks to quantum leaps in CGI and some really terrific set-pieces. Notably, the high school hallway, lined with book lockers, as the first twister comes ripping through during the middle of commencement ceremonies, the hell-on-earth abandoned mill (drown or get blown away … hell of a choice) and the desperation shelter sequence that wraps the movie. After the EF5 tornado that leveled Moore, Oklahoma in May of 2013 anyone who thinks that this Into the Storm is just Hollywood fiction might want to take a gander at some of the video of the devastation that marked that tornado event — 24 dead from a twister that measured over a mile wide! 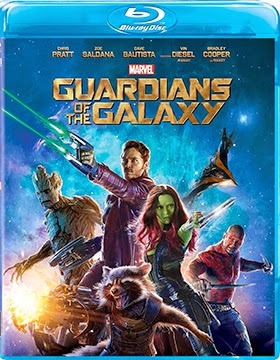 Walt Disney Studios Home Entertainment has quietly placed writer/director James Gunn's summer-season blockbuster, Guardians of the Galaxy, on its release calendar for delivery to retail on Dec. 9. Two Blu-ray/DVD Combo Packs are planned — one with a 3D viewing option and one without — as well as a stand-alone DVD edition. The ARR for that street date comes in at 130 days and the box office take was a stellar $319.2 million. Bonus features include commentary (unspecified), deleted scenes, a gag reel, featurettes (unspecified) and sneak peak at Avengers: Age of Ultron (May of 2015 launch). As you can see, not a lot of PR effort put into this home entertainment push. When you speak the names Michelangelo, Leonardo, Donatello and Raphael there is magic … box office magic. The latest theatrical blockbuster starring the Ninja Turtles will be heading home just in time for Christmas from Paramount Home Media Distribution on Dec. 16. The ARR works out to 130 days. This re-launch of the venerable franchise by Nickelodeon Movies delivered exactly what TMNT fans wanted. Action, clever dialog, action, more action (Liebesman, who scored with such films as Battle Los Angeles and Wrath of the Titans, deserves full credit) and yes, eye-candy, which comes in the form of Megan Fox —she lands on her feet here after her Transformers debacle. The final product is also beautiful to look at … all tech credits are solid! As to bonus features, these are limited to the Blu-ray SKUs. 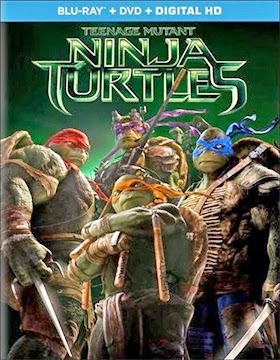 There are three featurettes — “It Ain’t Easy Being Green,” “Evolutionary Mash-Up” and “Turtle Rock” — an extended ending and the music video “Shell Shocked,” which comes complete with a making-of featurette. 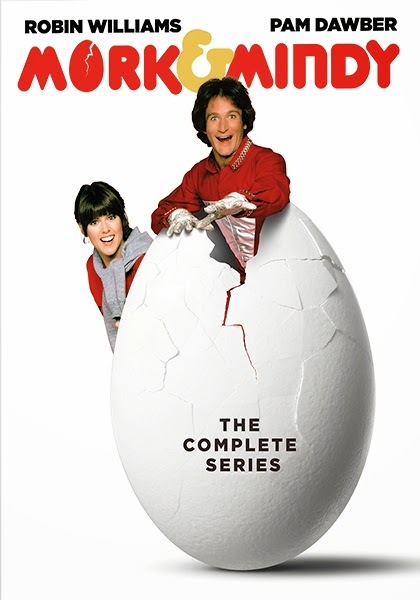 Also added to Paramount’s release calendar this week is the long-awaited DVD mega-set of Mork & Mindy: The Complete Series, teaming the late Robin Williams with Pam Dawber and “special guest star” Jonathan Winters. At the height of the “creature cycle” (or “monster cycle,” take your pick) of the late ‘50s there was one little indie film that delivered quite the bang for the buck. 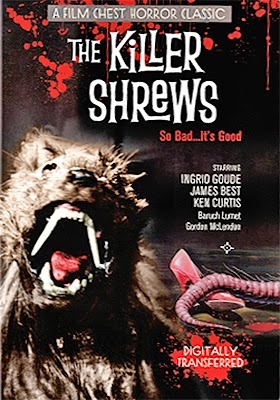 That was director Ray Kellogg’s summer of 1959 sci-fi thriller, The Killer Shrews, which is one of those movies that cost next to nothing to make, but lives on over a half-century later as an example of what can be done (on a shoestring) to stir up chills and thrills among its intended audience. 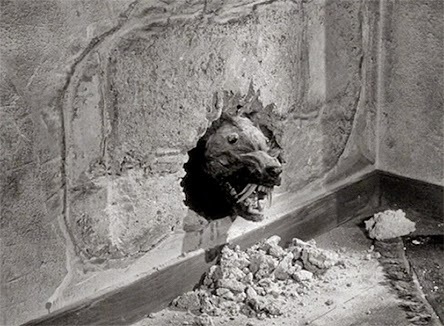 Word arrived this week that the Film Chest is ready with a newly-prepared digital transfer of The Killer Shrews. The street date is Nov. 11 and if the film transfer is a sharp as the new packaging, then this is a keeper! The story is deceptively simple. A group of people (the food source) are stranded on a remote island where a science experiment (all with the best of intensions of course) has gotten out of control. Tiny shrews have mutated into ever-growing carnivores that hunt in packs and have a taste for human flesh. And, to make matters worse (as if it can get any worse) they are growing exponentially and the only food supply left are the survivors boarded up in a house … surrounded by starving shrews. Yummy! 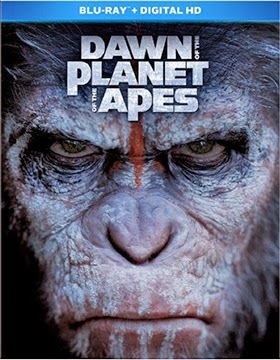 Caesar might well be the star of one of the biggest summer films of 2014, but when it comes to getting just a little help from the marketing, advertising and publicity departments over at 20th Century-Fox Home Entertainment these days he’s just another chimp. Sorry, no bananas for you. Despite pulling in $207.6 million in domestic ticket sales this past summer, the three-SKU launch of director Matt Reeves’ Dawn of the Planet of the Apes on Dec. 2 is being abandon to fend for itself in terms of DVD and Blu-ray sales to the consumer. The attitude is: “no need to support our product … it just sells itself.” Really? This lack of effort is shameful on so many levels. First, this is a blockbuster theatrical hit that is now making its way to the home entertainment market place — all of that hype and PR invested in the theatrical launch is being allowed to dissipate. That is, quite frankly, not how assets are managed — Marketing 101: Product, Place, Price and PROMOTION!!! Second, this is a venerable studio franchise that dates all the way back to 1968. To not even go through the motions of promoting it in the dingy “after market” of home entertainment smacks of both contempt for the product (after all, they are just monkeys … oops, excuse me, apes) and out-and-out negligence. Not using the momentum of this installment in the series to drive catalog sales leaves revenue on the table. It bears repeating — Marketing 101: Product, Place, Price and PROMOTION!!! 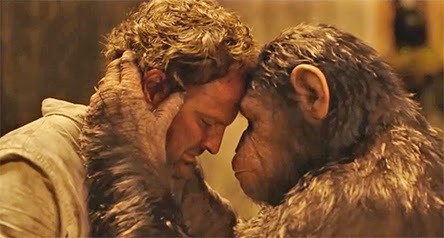 Lastly, what do you say to Mark Bomback, Tom Hammel and Matt Reeves … “Sorry guys, but promoting the DVD and Blu-ray launch of Dawn of the Planet of the Apes is simply not a priority.” It would be a delight to be a fly on the wall if those words were spoken. As for the Dec. 2 (that date yields an ARR of 144 days) home entertainment availability, there will be a stand-alone DVD SKU and two Blu-ray/DVD Combo Packs — one with, and one without a 3D viewing option. As to bonus features, the DVD edition is limited to a featurette titled “Andy Serkis: Rediscovering Caesar.” Exclusive to the Blu-ray editions are commentary from director Matt Reeves (Cloverfield, Let Me In, The Pallbearer, etc. ), deleted scenes (with optional commentary from Reeves) and additional production featurettes. Love can be hell. Love can be unkind. And the best of intensions can sometime be the portal to a living nightmare. 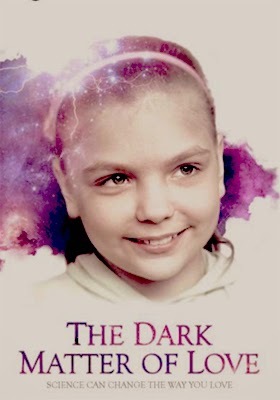 That’s what the Diaz family of Wisconsin discovered in documentary filmmaker Sarah McCarthy’s The Dark Matter of Love when they adopted an 11-year old girl named Masha from a Russian orphanage. She knew nothing of love and to make it all the more difficult, their own daughter, Cami, found her new sister to be for all intents and purposes an alien species who had just arrived from another planet. But the Diaz family didn’t give up, they sought help from unexpected sources (a mixture of science and common sense) and were able to provide a loving and caring home for both of their daughters … and well as two additional five-year old twins (also orphans from Russia). Virgil Films & Entertainment has tabbed Dec. 2 as the DVD release date for The Dark Matter of Love, an insightful — funny and sad — story, which is all the more compelling because it is true.